● Essential math tool for teaching number system. ● Face value and place value concepts up to 99. ● Addition up to 99. Concept of carry over in addition, convert 10 Units as a Ten. ● Subtraction up to 99. Concept of borrowing in subtraction; convert a Ten into 10 Units. ● Beads can be used for simple counting, colour sorting and threading. ● To form numbers, it needs only 9 beads in each place. One extra bead is provided to compensate any future loss. ● Base is wooden and dowels are metallic to ensure long life. ● Open ended dowels to enable operations. ● Ideal for classroom. Suitable for home schooler as well. ● Perfect for a desk. Products that go together : Use below mentioned products along with this tool for best result. (1) Wooden place value cards, (2) Base ten block kit and (3) Interlocking cubes. The place value is printed below the respective dowel; i.e. tens and ones. 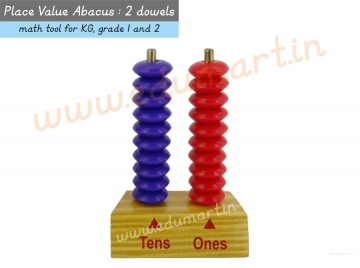 When upright, abacus measures about 7.5 x 10.5 x 4 cm. 2 sets of 10 beads : each bead approx. 2 x 0.8cm, different colour for each set. Note : Colour & Specification of the contents are subjected to amendment. Dimensions: 7.5 x 10.5 x 4 cm approx. Country of origin : Proudly Made in India.